I have a colleague and friend who is unwell at the moment. It is an awful feeling when someone you know is really very sick – and finding ways to help, and showing you care makes all the world of difference…to them and you! 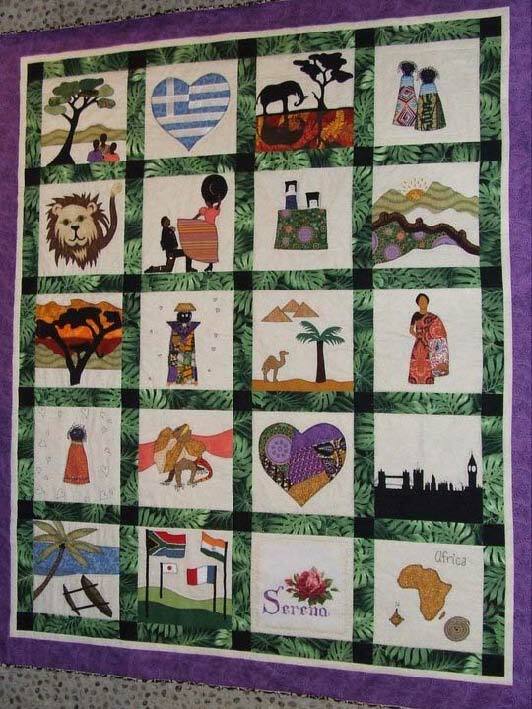 This blog aims to highlight one way to draw together the social capital among small groups of friends, colleagues, family… whoever… for the purpose of collaborating in the development of a quilt gift to give to a person who is recovering. Bringing together a group of people to collaborate in building a quilt as a gift, is one way in which it is possible to develop a tangible expression of care, concern and hopefulness for recovery. 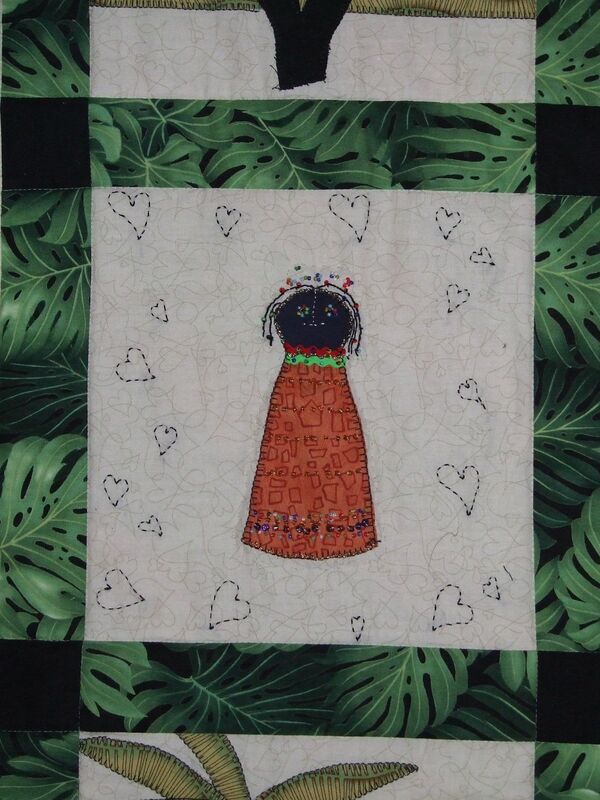 Quilts convey both a physical and an emotional warm, a closeness and some comfort, and the expression of these elements in a gift of a quilt can carry with it some positive affect to enhance recovery. 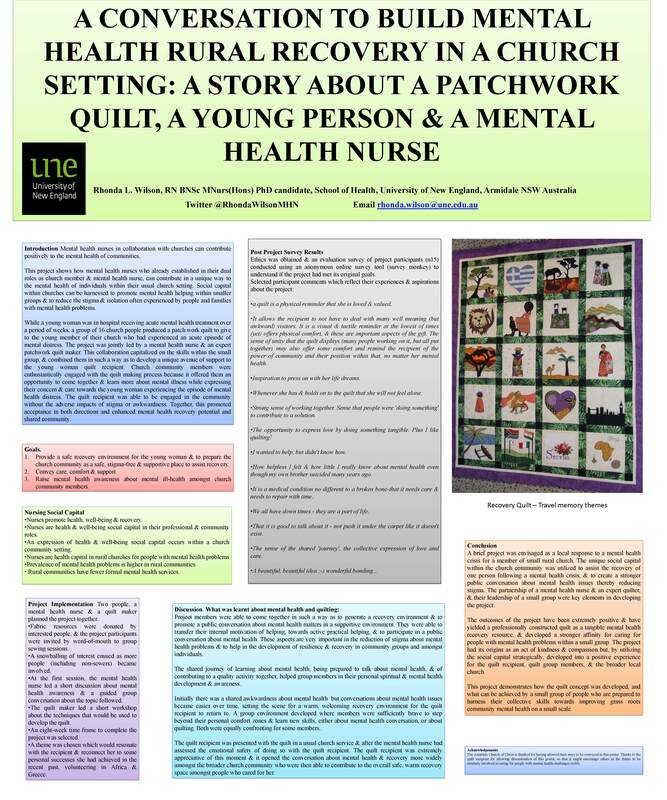 I have written a paper about how this has been done in the past – you can read more about some research about recovery quilting here. Wabi-Sabi – imperfect is beautiful! A collaborative quilt doesn’t need a great deal of sewing skill or expertise, and creating a project that non-sewers can be included in is possible. The quilt doesn’t need to be stitch-perfect. In Japanese culture there is a concept of Wabi-Sabi – imperfectly beautiful! I think collaborative care expressed in a quilt is an ideal match to the wabi-sabi concept. A little bit of guidance and some inspiration – everyone can have a go and contribute something, without the expectation of being perfect. A relaxed and inclusive way for everyone to work together. I have contributed to a few collaborative quilts – and in my experience, the beauty really is in the varied interpretations and inspirations of each contributor. The meaningfulness that is sewn into each block is a great way to ensure variety. And, with this level of flexibility – it works! Fabric for the top – avid quilters will have a stash! (they can’t help themselves!) Ask them to contribute some… or use some reclaimed/ vintage fabrics from an op-shop. Or – buy a ‘jelly roll’ (cut strips of fabric) from a patchwork or fabric shop. What ever you do to collect your fabric – you will need to give it to your quilting collaborators in a ready made/cut blocks. A block will be easiest to work with if it is a square shape. The size doesn’t matter – but do make sure that all of the blocks are exactly the same size. Here is a free pattern if you need one! And some youtube guidance if that helps! Middle – batting. Go to a quilt/ fabric shop and buy the quantity you need. You don’t have to have batting… you might prefer to use a cosy backing instead (eg fleece or chenille). The batting is best new – choose a wash and wear type. I prefer bamboo or cotton. Backing – can be a reclaimed sheet, tablecloth, curtain or bed spread (op-shop again!) Or – you can buy some plain fabric for the back. Distribute the blocks to the collaborators and encourage people to have a go! The more that contribute – the more beautiful the diversity! Here is a list of my favourite ideas about what to put on your block…. it is only a sample of ideas shared (and borrowed) to stimulate your own creativity! Pinterest is a great source of inspiration and has lots of tutorials and patterns to get you started if you need some! Remember to leave 1 1/2cm border around the edge so the blocks can be sewn together. Doilies are a great and simple edition to a block. 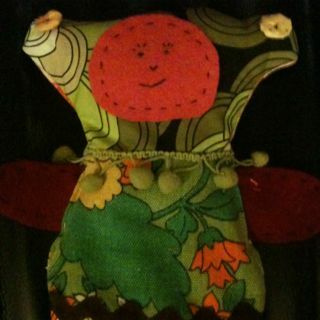 They can be easily hand sewn onto a block. Buttons sewn in a corner or in a shape, eg bird or heart. Crochet a mandala or a granny square and sew it on your block. Use a simple stitch to make a monogram or to stitch a shape design – eg a heart, star, or just straight or spiral lines. Applique – a fancy word that means sewing one layer of fabric over another. You can use fusible iron-on webbing to stick the fabric together and then blanket stitch around the edge of your shape, but you don’t have to. Use floss/ embroidery thread to embroider some stitches…. as fancy or as simple as you like. A cross stitch animal, tree, or design in a corner of your block for example. Use some yarn or ribbon to make a design on your block and then ‘stab’ stitch it in place to stabilise your design. Cut some felt flowers and sew a button in their centres to stabilise the flower on the block. 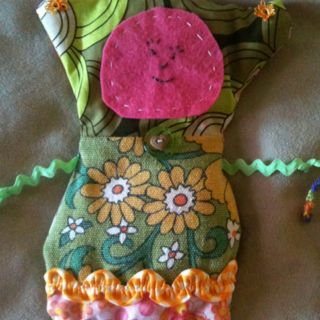 Leave the petals free or blanket stitch them in place. Or make some felt birds! Cut a range of various sized circles of fabric or felt and layer them to look like flower petals – secure with a centre button or bead. Make some tiny pom-poms – or buy pom-pom ribbon – cut, arrange and sew in place as a bunch of balloons in a design. Add beads and sequins to your block or sew a trinket, mirror disc or charm in place. Here are some links to some craft sites that might be sources of creative inspiration for some!